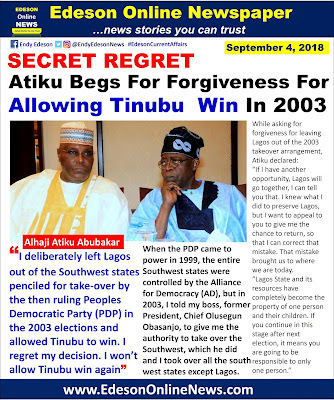 Presidential hopeful and former Vice President, Alhaji Atiku Abubakar, has revealed that he deliberately left Lagos out of the Southwest states penciled for take-over by the then ruling Peoples Democratic Party (PDP) in the 2003 polls. The PDP presidential aspirant made the disclosure yesterday, while meeting with party stalwarts in Lagos. He said he deliberately excluded Lagos by then because of his long-time relationship with the former Lagos governor, just as he pleaded with the people of the state to forgive him for that costly mistake. , which he did and I took over all the southwest states except Lagos. While asking for forgiveness for leaving Lagos out of the 2003 takeover arrangement, Atiku declared: “If I have another opportunity, Lagos will go together, I can tell you that. I knew what I did to preserve Lagos, but I want to appeal to you to give me the chance to return, so that I can correct that mistake. That mistake brought us to where we are today. He also flayed the economic policies of the ruling party, saying Nigeria now has the worst economy since the return of democracy in 1999. So he would've taken Lagos just like that if he wanted? He's trying to paint himself as one powerful political juggernaut that he isn't. Adzufeh Steven Adzufeh hear this. He is destroying his little chance.